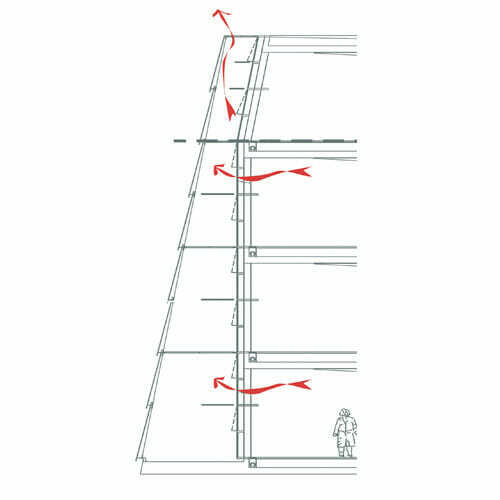 One of the main difficulties in designing low energy buildings can be the prevention of noise break-in via vented facades. Here we look at a range of options and details which can be used to reduce environmental noise break-in from the many noisy sources affecting modern buildings, including motorways, dual carriageways, trains, airplanes and inner city noise. 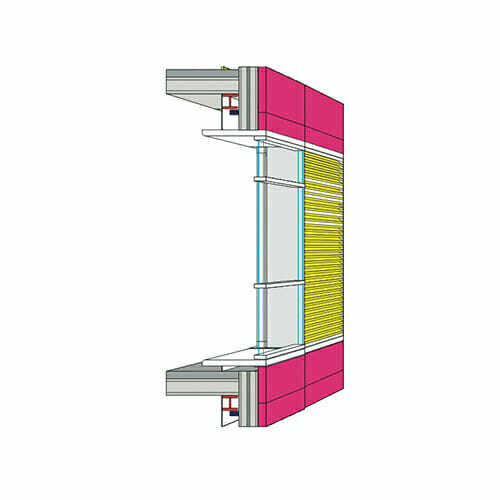 To overcome this issue, an attenuator is selected and incorporated into the facade. 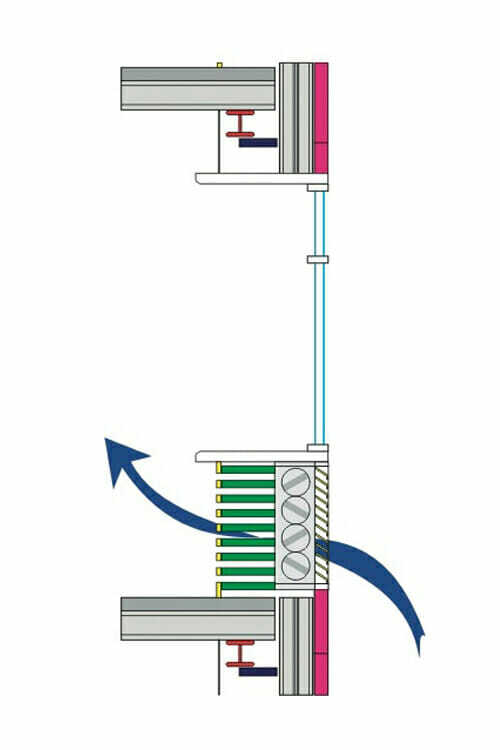 This attenuator is typically combined with a damper to control the flow of air into the building, with a weather louvre being used externally to provide weather protection. MACH Acoustics describes this combination of units as the ‘Honeycomb Attenuator Box’. The outline schematic of this system is shown here (right). 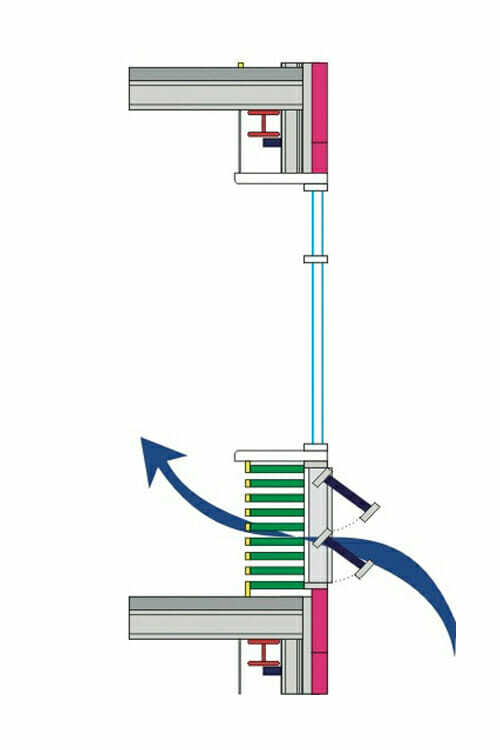 The damper can take the form of a thermal volume control damper, openable vents within the facade or thermal insulated doors etc. The orientation of a building has a significant impact upon noise levels at the different facades of the building. 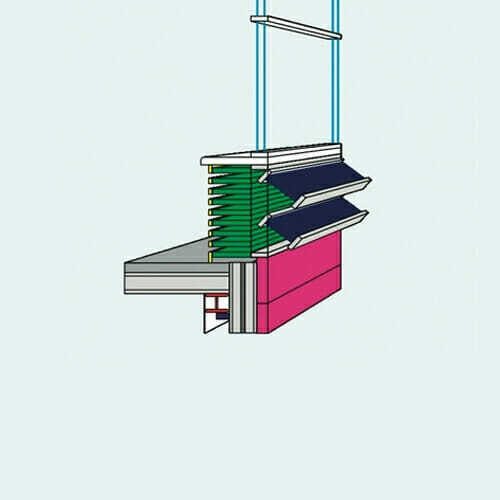 It is often the case that facades on the opposite side of a building to a significant noise source will have considerably lower noise levels than those on the noisy side of the building. By orientating the building and locating non-critical spaces on the noisy side of a building, it is possible to form a good acoustic buffer. In these instances, cross vent can be used where the air intake is placed on the quiet side of the building. 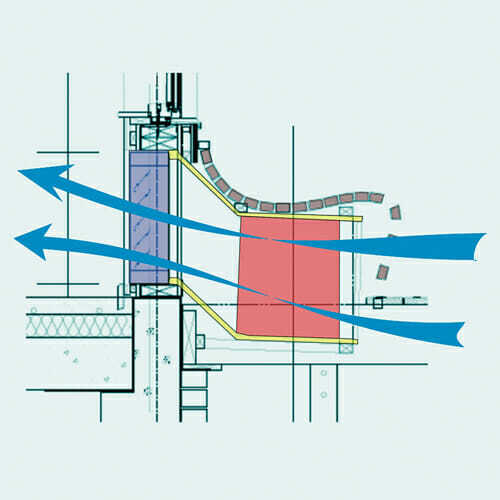 Cross ventilation to an atrium or circulation zone is then used to provide the air extract. 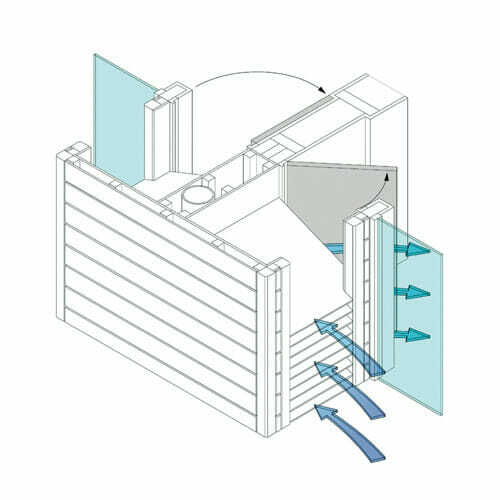 Alternatively, single sided ventilation could be used for sensitive spaces on the quiet side of a building. This noise map (opposite) shows that screening reduces noise levels on the far side of the building from the dual carriageway sufficiently to allow natural ventilation by means of openable windows. 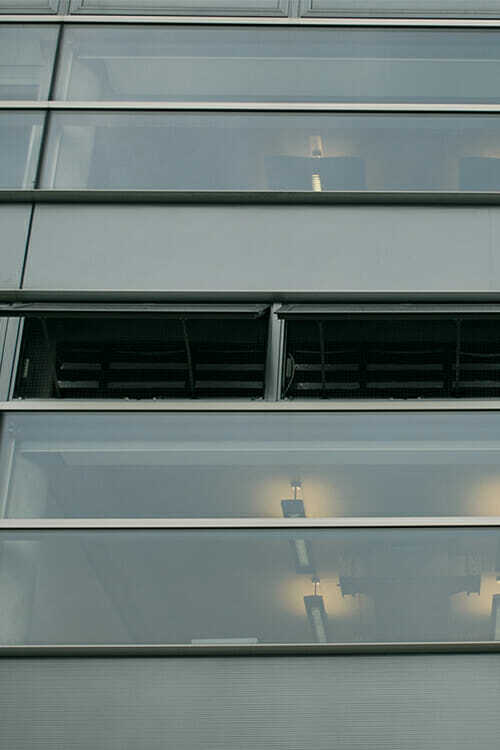 In instances where a building is located on an exceptionally noisy site, cross ventilation can improve the feasibility of natural ventilation. 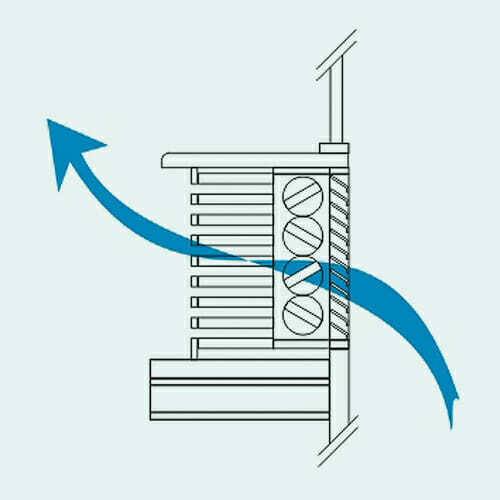 Cross ventilation (see below) has an important advantage over single sided ventilation, in that air inlet vents can be between 25% to 75% smaller than those required for single sided ventilation. 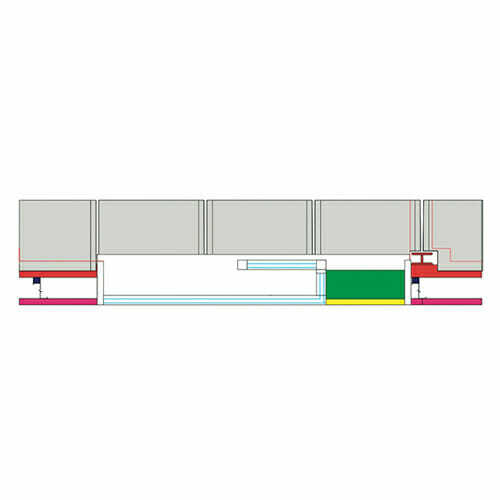 This significant reduction in vent size helps considerably in preventing noise break-in, as smaller vents restrict the passage of sound into a building. 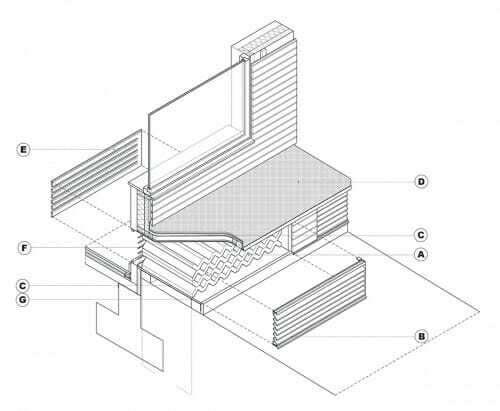 Adding vented attenuation to the facade of a single-storey building is comparatively easier than for a multi-storey building. 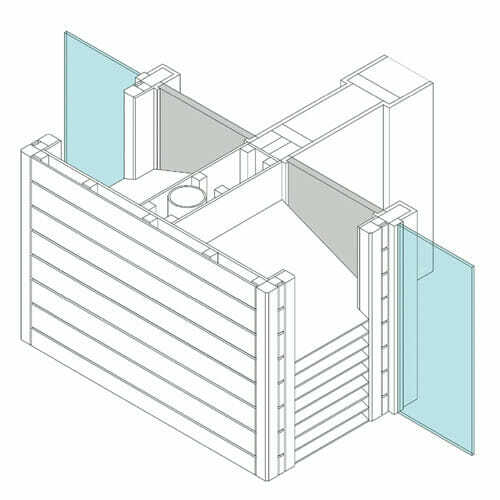 It is often possible to extend the building envelope, accommodating the additional depth of the Honeycomb Attenuator Boxes within features. 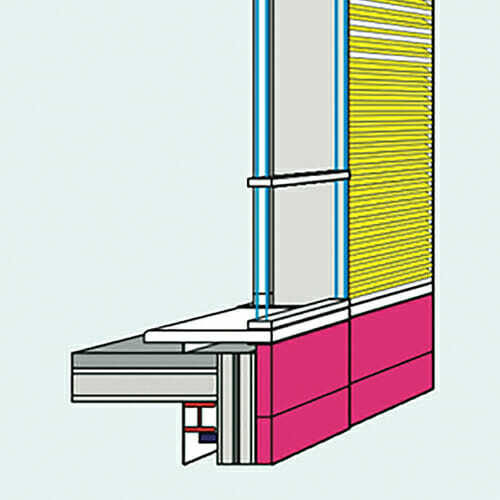 In the case of single-storey buildings, it is common to maintain a simple vertical thermal line by placing the thermal damper into the line of the facade (see opposite). The acoustic attenuation in this instance is placed outside the building line. 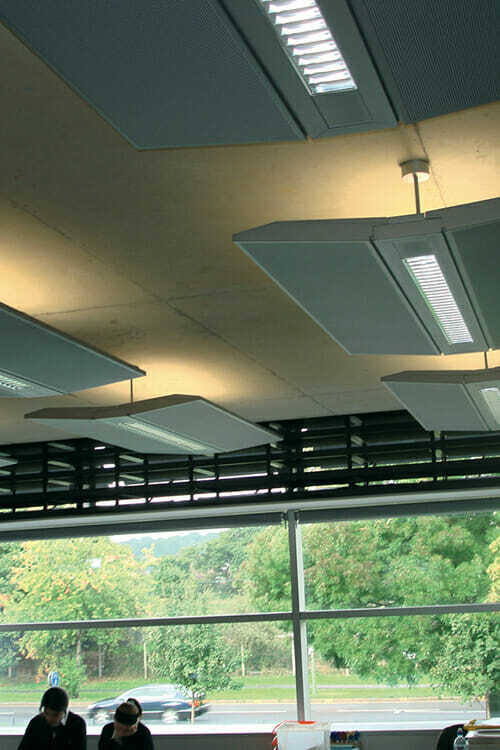 This design approach has been implemented by MACH Acoustics on several projects. The Honeycomb Attenuator Box has been installed under bench seating, flower boxes, play boxes, small steps in the facade and other elements. 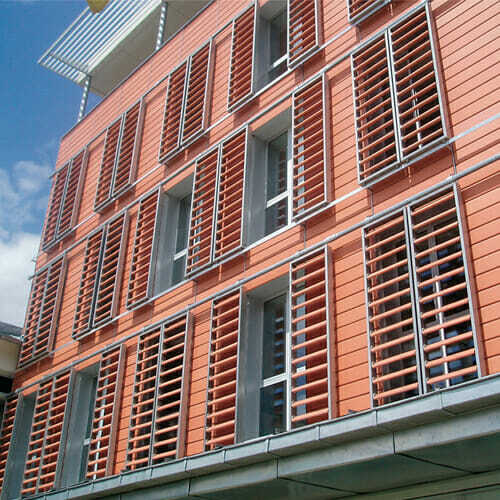 These units have all been used to hide and accommodate the additional facade depth often required when naturally ventilating a building on a particularly noisy site, often without being noticed by the users! A second advantage of single-storey buildings is the potential to incorporate the Honeycomb Attenuator Box above or within roof lines, above corridors, over storage rooms and other areas. 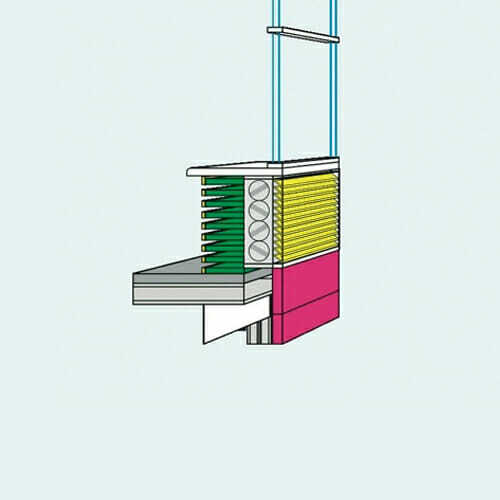 The details used to incorporate the attenuation box into a seat or play box are very similar to those used when incorporating the Honeycomb Attenuator Box into the facades of buildings. 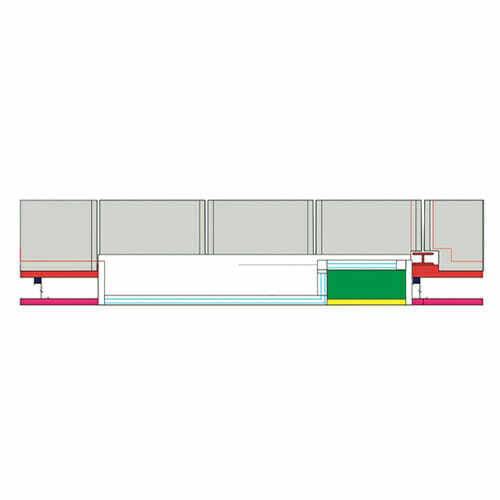 As noted, it is often easier to extend the facade line of single-storey buildings to accommodate deep attenuators. This in turn means that it is potentially possible to provide natural ventilation irrespective of how high the noise levels are. The illustration (left) was used to control noise break-in to a sensitive office space in close proximity to a major motorway. Forming the Honeycomb Attenuator by tessellated, W-shaped foam blocks means that this product can easily be dropped into a timber enclosure or metal duct work. The W-shaped tiles compress and can be cut to any size, hence these units are extremely easy to accommodate into the facade of a building. 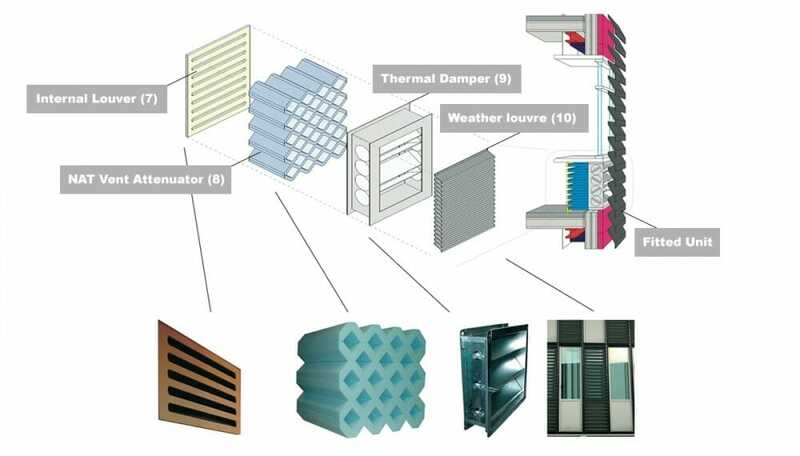 The thermal damper is one of the main factors affecting the cost and depth of the Honeycomb Attenuator Box. 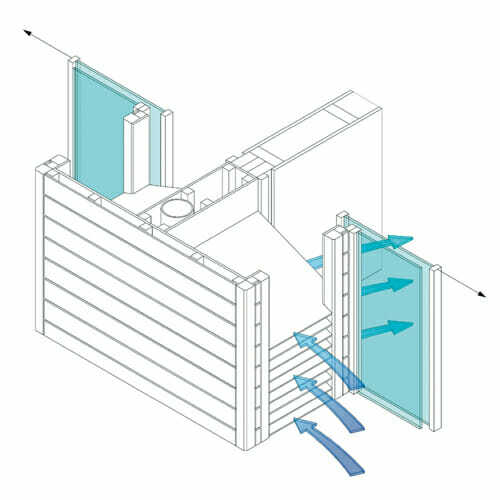 Replacing the damper with an openable or motorised vent/window eliminates both the thermal damper and weather louvre from the box make-up. This typically reduces cost by around 50% and can reduce its depth by approximately 200- 300mm. Facade and window manufacturers can easily accommodate openable vents in curtain walling or window frames. Placing the Honeycomb Attenuator directly behind an open vent is a simple, cost effective design solution to prevent noise break-in. When noise levels are exceptionally high – for example due to motorway noise, flight paths or inner city noise – the depth of the attenuator needs to be increased. The additional depth of the Honeycomb Attenuator Box can be accommodated by using a high level bulkhead. As shown opposite, the Honeycomb Attenuator Box can also be used to provide a vertical air inlet. 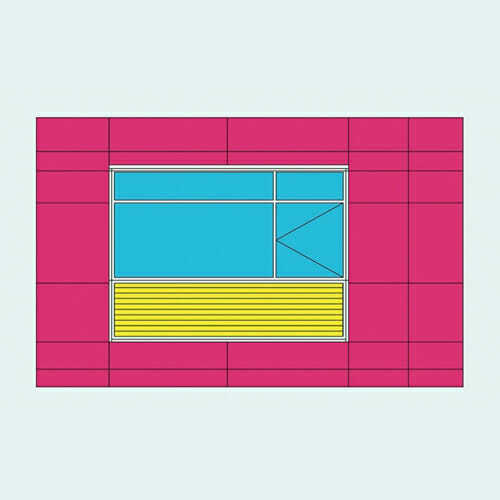 This arrangement provides a design opportunity to provide colour and depth to a building’s facade. A second advantage is that it is often possible to place Honeycomb Attenuator Boxes within the corner of a room. Here it may be easier to incorporate a deeper Honeycomb Attenuator Box. Alternatively, it may be possible to pull the facades out in certain areas to accommodate a deeper Honeycomb Attenuator Box. 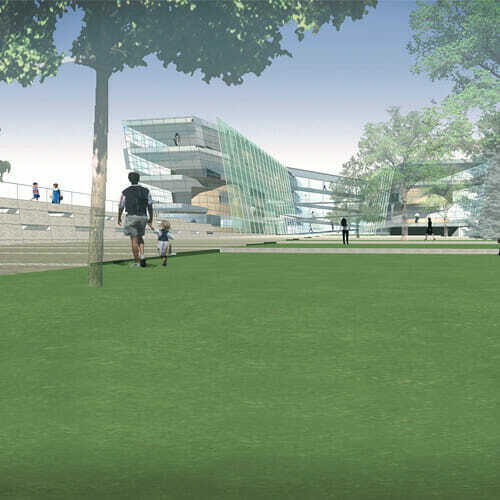 Both of these designs are recommended when external noise levels are particularly high. 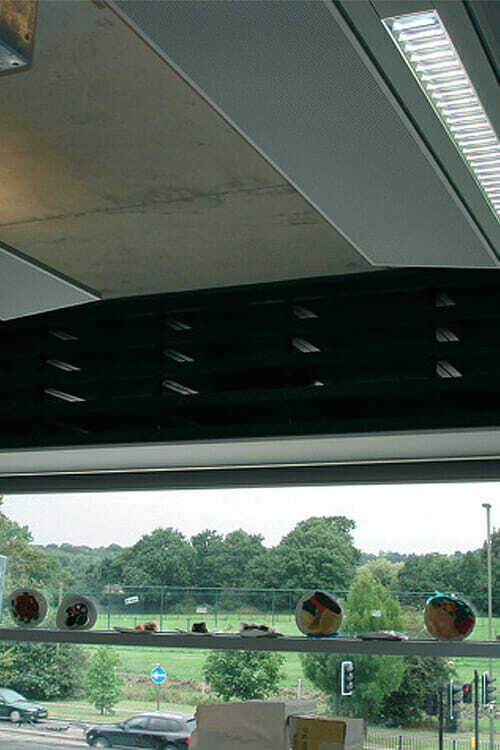 A further benefit of using a vertical louvre is the potential to incorporate acoustic attenuation into the blades. 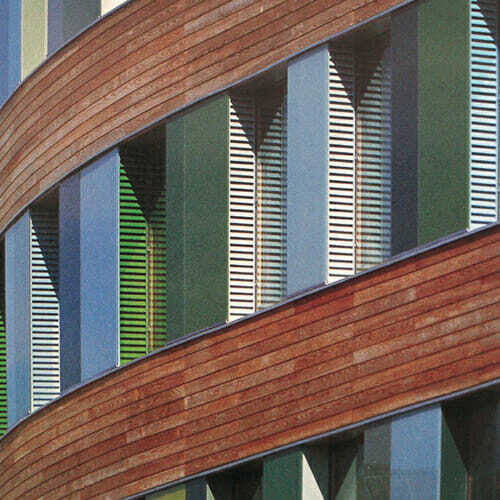 Depending on the free area, this design can only be adopted if the louvres run vertically. 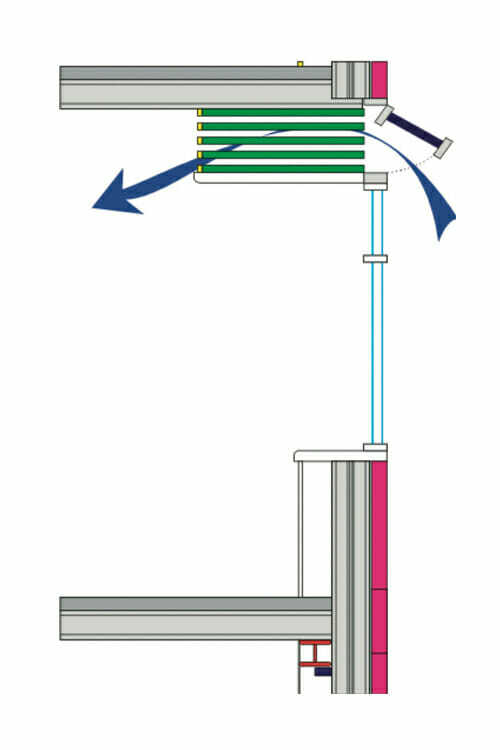 The illustrations here show some alternative arrangements where the Honeycomb Attenuator is placed outside a thermally insulated door or sliding window. 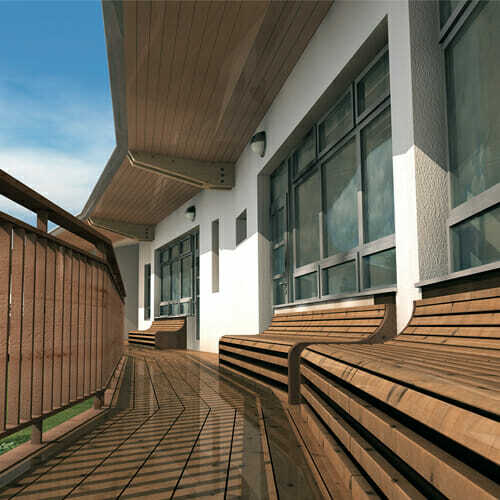 The key advantage of this is that it eliminates the need for a thermal damper. Additionally, it can often be easier to accommodate the Honeycomb Attenuator Box outside the thermal line. 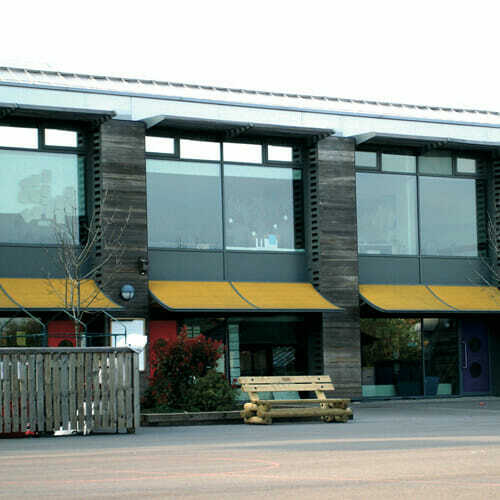 Double facades can be used to control environmental noise break-in without the need for acoustic attenuation. 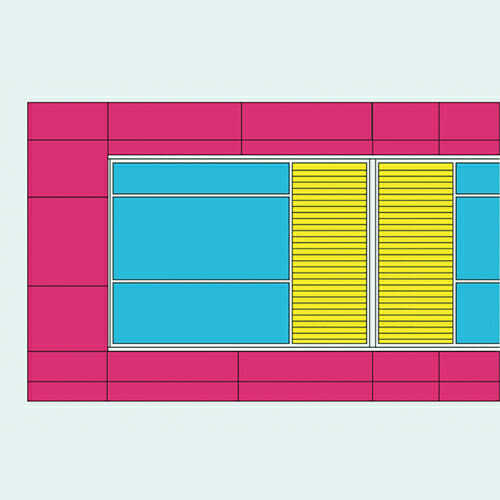 When using a double facade, air enters the building through conventional open windows. 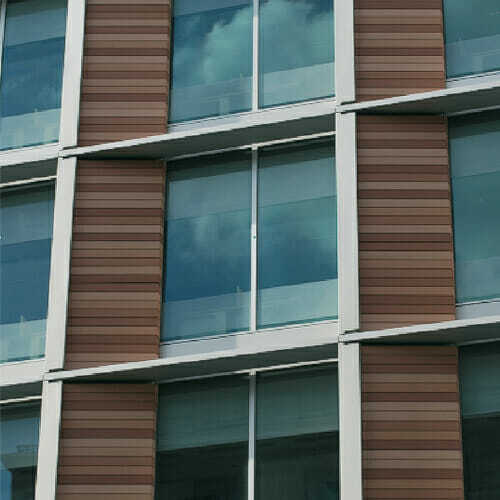 The acoustic protection is achieved by acoustically screening these windows by means of a secondary facade. 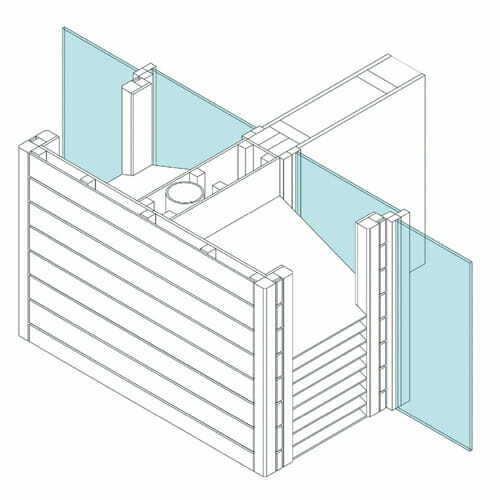 Air enters the void between the two facades via a gap at the bottom of the outer, secondary facade. 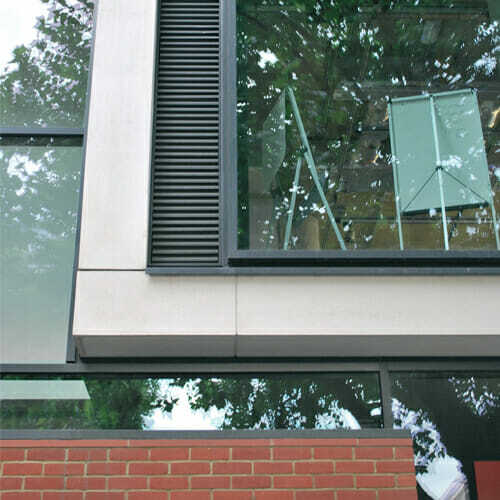 The edges of the secondary facade are typically taken back to the primary building envelope. 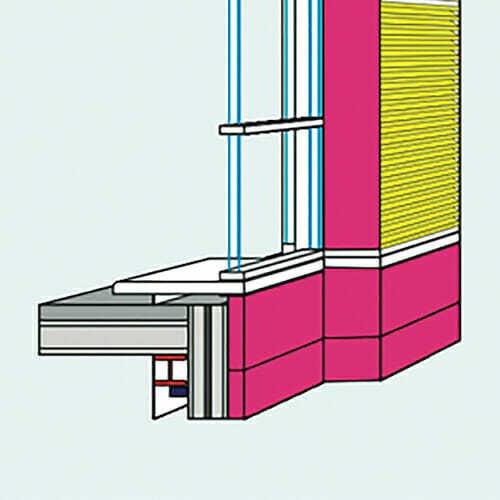 Attenuation may be required at the air inlet between the two facades. 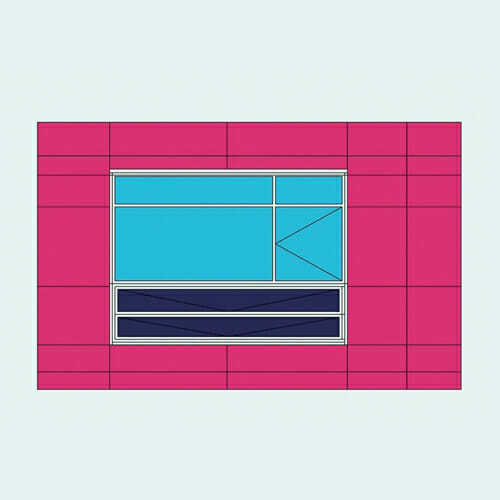 The advantage of this type of facade is the fact that simple openable windows can be used. 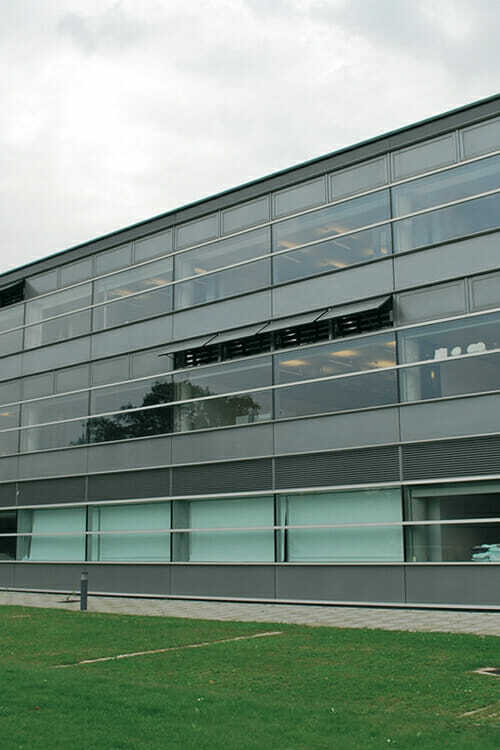 It is also possible to form buildings with an interesting and unique appearance.The drawbacks are clearly the costs and space and for these reasons this type of noise control measure is less common. 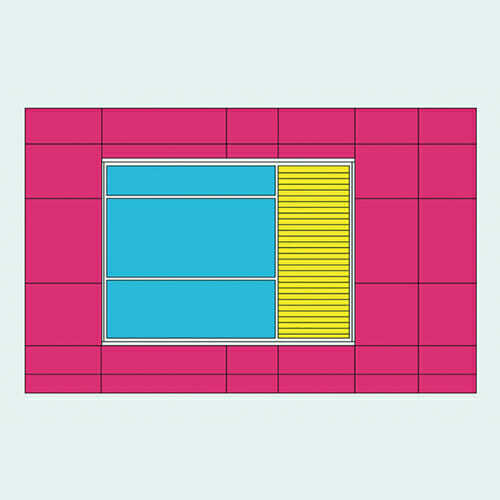 It is also important to note that secondary facades can compromise the acoustic separation between two rooms when windows are open. 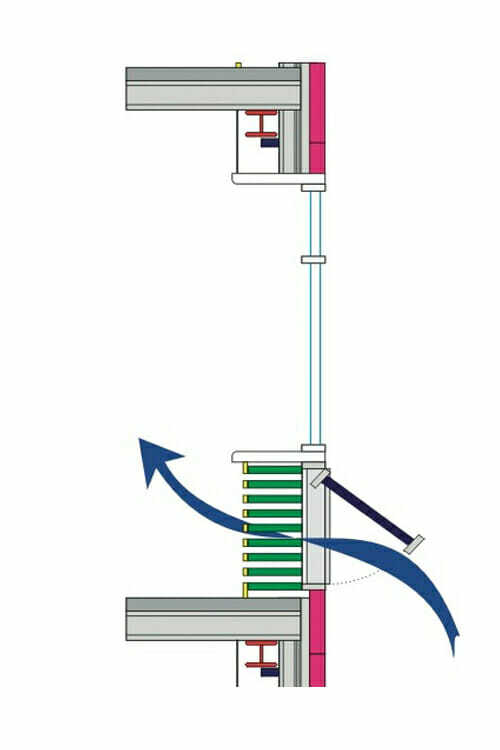 Acoustic splitters/absorption may be required to maintain the sound insulation via two open windows.